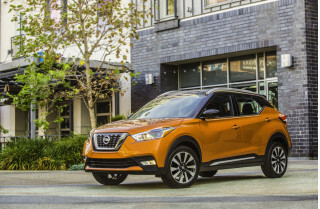 Shopping for a new Nissan Kicks? 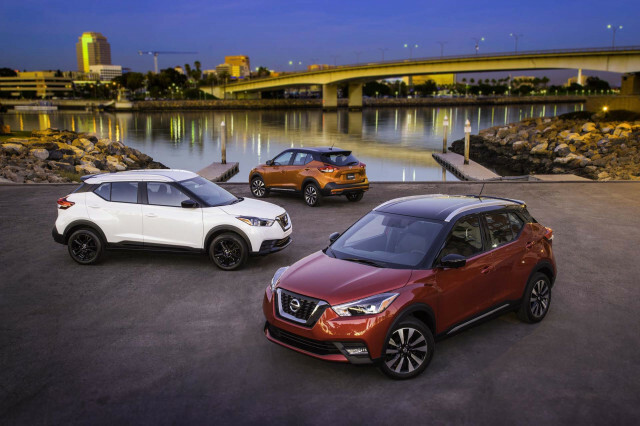 Apple CarPlay and Android Auto require stepping up to the Nissan Kicks SV. 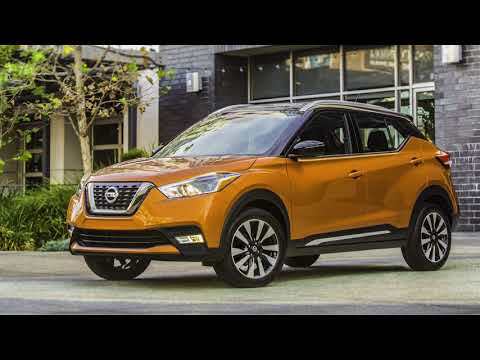 The 2018 Nissan Kicks stretches the definition of crossover SUV. 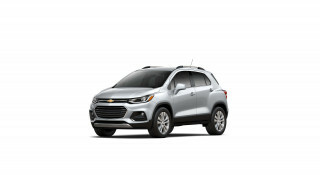 Its perky styling may be butch in just enough places to hint at utility, but pint-size dimensions, limited underhood muscle, and no option for all-wheel drive confine the 2018 Kicks to feeling more like a little hatchback with verve. Viewed as the tall hatchback that it is—it shares its platform with the budget-grade Nissan Versa, after all—the Kicks delivers a modern, pleasant driving experience for not much cash. The 2018 Kicks is available in a trio of trim levels—S, SV, SR—that share a 1.6-liter inline-4 engine rated at a paltry 125 horsepower paired to a continuously variable transmission (CVT) and front-wheel drive. With just 2,650 pounds to shuffle around, the Kicks isn’t slow, but it’s not exactly a corner carver, either. It’s also short on off-roading credentials since all-wheel drive isn’t on the options list. The Kicks’ expressive exterior gives way to a muted, but well-equipped interior. Four adults fit fine as long as they’re not broad-shouldered, and the 25.3 cubic feet of cargo space behind the rear seat will swallow their suitcases. Let’s just hope they’re merely driving to the airport, since the Kicks struggles at highway speeds. That little engine that kind of, sort of could doesn’t impart a big penalty at the pump; the Kicks is rated at 31 mpg city, 36 highway, 33 combined, according to the EPA. At about $19,000, the base Kicks S is cheap, cheerful, and not lacking for too much. That price includes surprising safety gear like automatic emergency braking, plus a 7.0-inch touchscreen for infotainment with Bluetooth with a trio of USB charging ports. The Kicks SV runs $1,700 more but seems worth the cash for its upgraded infotainment with Apple CarPlay and Android Auto support, alloy wheels, automatic climate control, and configurable LCD screen in the instrument cluster. The 2018 Nissan Kicks doesn’t look like a frog. Its predecessor, the Nissan Juke, certainly did. Whether that’s a good thing is up to you, but we prefer the Kicks’ more cohesive appearance and its comparatively subtle styling charms. 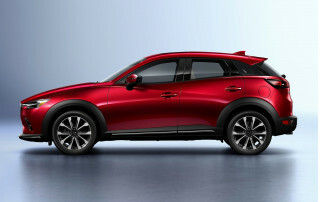 The Kicks sits slightly higher than a typical five-door hatchback, yet its seating position won’t be confused with a crossover. Up front, the Kicks looks downright conventional, kicking the Juke’s bug-eyed headlights to the curb in favor of a wide grille. At the rear, the angular taillights could have been plucked from just about any other car or crossover in Nissan’s lineup. The unpainted bumpers and fender flares save Nissan a few bucks while giving the Kicks a more rugged feel than its lack of all-wheel drive would otherwise suggest. Standard 16-inch wheels on the Kicks S look downmarket, but Nissan figures most buyers will opt for the SV with its 17-inch alloy wheels and its available contrasting roof that makes the most of its “floating” rearmost pillar. Inside, the Kicks breaks little new ground. Its dash features a 7.0-inch touchscreen for—with more sophisticated software and Apple CarPlay/Android Auto on SV and SR trims—but the screen washes out in bright light. A textured panel adds some visual interest and we actually like it more than the stitched vinyl covering that’s on SRs with the Premium package. Nissan could have played a little more with fun colors and materials inside the Kicks, but the overall look is about right for its low price tag. The 2018 Kicks comes in just one basic configuration: as a front-wheel-drive subcompact car riding on the automotive equivalent of stilts. 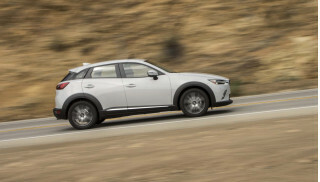 Its 1.6-liter inline-4 engine is rated at 125 hp and 115 pound-feet of torque and it puts power to the front wheels via a continuously variable transmission (CVT). Those are hardly impressive figures, but they’re tasked with motivating just 2,650 pounds of metal. Initial throttle tip-in is brisk but reasonably well-modulated, giving the Kicks a zippy feel around town that fades quickly on highways. Passing requires ample planning; familiarize yourself with the right lane. To its credit, little 4-cylinder thrash makes its way to the cabin and simulated “gears” alleviate the droning, rubber-band effect that marred the experience in older vehicles with CVTs. A little switch hidden on the transmission lever fires up a sport mode on the Kicks SR, or so it says. We pushed it watched the tachometer needle swing slightly higher, an S light illuminate in the instrument cluster’s LCD screen, and that was about it. Any improvement in power accessibility was exceptionally subtle. Otherwise, the SR trim is merely an appearance and feature upgrade, not a sportier model. The Kicks’ three-spoke, flat-bottomed steering wheel feels great in the driver’s hands—at least while at a stop. Put through its paces on a curvy road the Kicks we drove on an initial preview drive near San Diego felt nimble and planted, but far from entertaining. Its handling was safe and uninspiring, hardly a surprise given the bargain bin twist-beam rear suspension picked for its low cost and complexity. The Kicks rides well enough, with good isolation from the road and surprisingly little chop for a vehicle with a 103.1-inch wheelbase. So too the Kicks’ brakes—discs up front and antiquated drums out back—which provide good stopping power but look laughably small behind the 17-inch alloy wheels fitted to SV and SR trim levels. Don’t look for the Kicks to go far off-road. Ground clearance, at 7.0 inches, isn’t as much of a factor as the lack of all-wheel drive. Though its interior is spacious enough for four adults—not five—the 2018 Nissan Kicks’ pert dimensions dictate a lot of compromises. 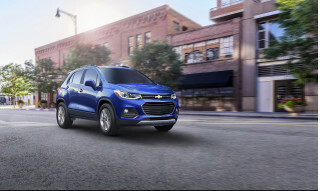 The Kicks comes standard with cloth upholstery that feels tough and durable, while synthetic leather is included with the $1,000 Premium Package on the Kicks SR. Up front, the seats are nicely padded and sit up higher than a typical small car but don’t offer great long-distance comfort. Drivers have a narrow fold-down armrest, but passengers get nothing. The Kicks has five seatbelts, but at least one of those passengers should be kid-sized. The rear seat delivers surprisingly good leg and head room but suffers from the same narrow feel as the front seat. 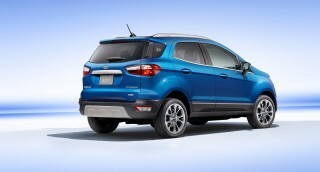 With the rear seat upright, the Kicks boasts 25.3 cubic feet of cargo space. The second row’s backrest folds in a split arrangement to expand that to 53.1 cubes, with two caveats: much of that space is well above the window line and the cargo floor sits much lower than the slightly angled rear backrests. The Kicks earns no points for its interior decor, either. No texture feels ambitious—the chintzy headliner, the airport carpet-grade flooring, or the hard plastics that dominate the dash and doors. Given its playful nature, the Kicks strikes us as a missed opportunity for some interior flair. Standard automatic emergency braking and seven airbags highlight the 2018 Nissan Kicks’ comprehensive level of safety equipment. 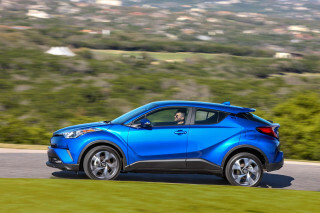 All versions of the Kicks can stop on their own if they detect an impending collision, a feature matched in this segment only by the Toyota C-HR. A rearview camera is also standard equipment and a surround-view camera system is on the options list. Stepping up to the Kicks SV nets blind-spot monitors and rear cross-traffic alerts. All that’s lacking is adaptive cruise control, admittedly something few of the Kicks’ competitors offer. The IIHS rates the Kicks a Top Safety Pick, dinging it for subpar headlights in most trims; the standard halogen units rate "Poor," while the LEDs in the Kicks SR are rated "Good." If you were expecting a Mini Cooper-like shopping experience, the 2018 Nissan Kicks will disappoint with its limited lineup. 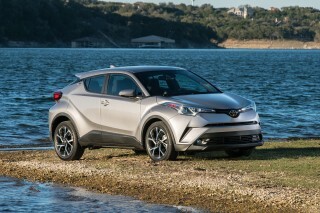 Then again, all three trim levels are well-equipped for the money. The Kicks S anchors the lineup at a hair under $19,000, and it includes a 7.0-inch touchscreen for infotainment, automatic emergency braking, a rearview camera, and 16-inch steel wheels with hubcaps. It’s not quite basic, but it’s not quite fancy. Spend about $2,700 more and you’ll net the Kicks SV. We think it’s worth the money. Its 17-inch alloy wheels lend it a dressier look, while a 7.0-inch screen in the instrument cluster classes up its interior. Apple CarPlay and Android Auto make the most of its infotainment system, too. The Kicks SV is also available in a wider range of colors and can be kitted out with a contrasting roof in several shades. We’re partial to orange. Topping the lineup, the Kicks SR piles on LED headlights, a leather-wrapped steering wheel, and its own seat fabric for $600 more. For an extra $1,000, the Kicks SR’s Premium Package adds heated front seats, Bose speakers, and synthetic leather upholstery, but it starts to gnaw at the Kicks’ value equation. Notably there’s no moonroof option, but that’s not inexcusable at this low price point. All told, a Kicks with every factory option still comes in under $23,000—not a bad deal for a city runabout. The 2018 Nissan Kicks isn’t very powerful, but it also doesn’t weigh much. 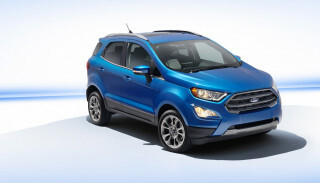 Its fuel economy ratings aren’t as good as some subcompact hatchbacks, but they’re decent for a taller-riding crossover. 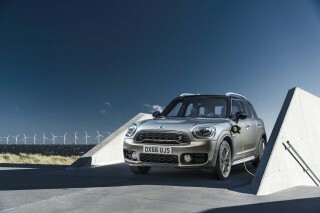 The Kicks does without any whiz-bang features like a plug-in hybrid powertrain to earn those figures. Instead, it’s a lesson in simplicity with a curb weight of about 2,650 pounds and a diminutive inline-4 engine paired to a continuously variable transmission (CVT). Looking for a different year of the Nissan Kicks?